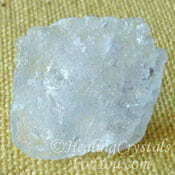 Albite is a helpful crystal to use as it stimulates the brain, which can enhance your memory and boost you mentally. 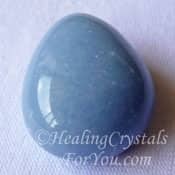 It has a number of useful effects within the crown chakra and the brain, including helping you to think more clearly and logically. 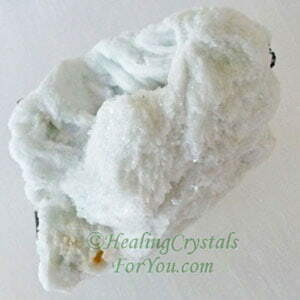 These white crystals assist you to be inspired to take action when required and are beneficial to use for meditation as their energy activates the third eye which may intensify your intuitive gifts. 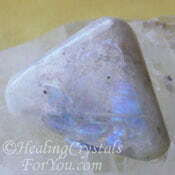 They may awaken psychic powers, and also enhance exploration within the spiritual realms. 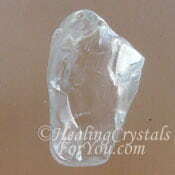 Keep on the body during the day or keep a piece in the bedroom to encourage lucid dreaming. 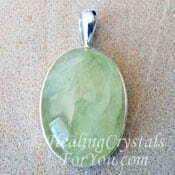 Its energy within the brain is also helpful for healing physical problems within the brain and may also aid a number of other health issues. 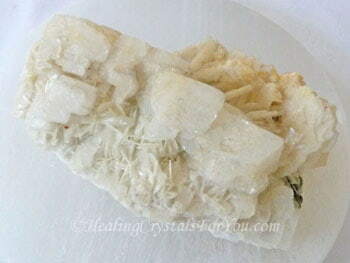 The meaning of the name Albite relates to a Latin word meaning white, as there was commonly a plentiful supply of the pearly white colored stone when it was discovered. 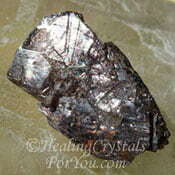 Other colors since found include colorless, blue, grey, pink, brown and reddish brown. 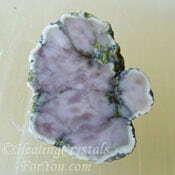 Their perceived color may relate to inclusions in the stone, as they may visually seem to take on the color of the included mineral. 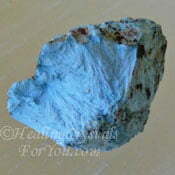 These stones are a type of feldspar and often occur as quite brittle stone... in the platy, tabular and massive form. They are found in a number of places, including in South Africa, Canada, the USA and in Scandinavian countries such as Greenland. 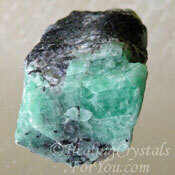 They may occur with inclusions of other minerals in them, including Green Tourmaline, which you can see in one of the pictures further down the page. 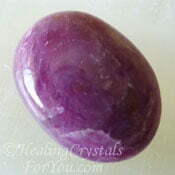 One of the more powerful reasons to use these stones is their action within the crown chakra to stimulate the brain, which may initiate clear and logical thinking. By also assisting you to have a more orderly approach to your thought processes this may aid you to acquire knowledge in a new way. They may help you to create a more balanced lifestyle, helping you to plan your life and ensure that no aspect of life becomes out of proportion and takes more of your energy than it should. Their energy may be useful for students by both helping you to think differently and to retain what you have learned. 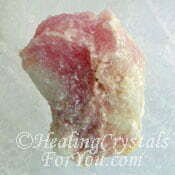 They also have a good healing action within the brain as well as helping to heal a number of other heath issues. 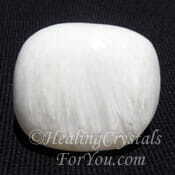 The vibration of Albite is known to bolster your intuitive ability and enhance your memory, and may help to stimulate inspirational thinking. While all of us are intuitive to some degree, it can be helpful to boost your intuition if you do not feel that it has been working as well as you'd like. 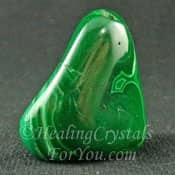 Inspiration is often closely related to intuition and you may find that they come together when using this stone, assisting you to discover the actions to take to create the life you desire. The unity of inspiration and intuition can be quite empowering and may be highly effective to allow you to gain greater clarity about what your future path might look like. 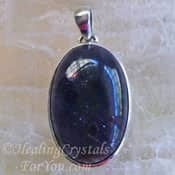 While it is not common for this stone to be made into crystal jewelry, it is an Aquarius birthstone, so it may be possible to find crystal birthstone jewelry made from this stone. 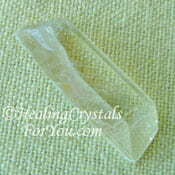 It is possible to buy Albite pendants at shops that specialize in stones to use for metaphysical purposes. 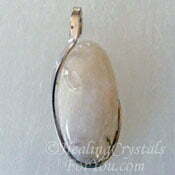 Wearing jewelry is my favorite way to use most stones, as its an easy way to keep it on your body. 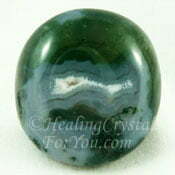 While you can keep this stone in your pocket, you will need to buy a tumbled stone like the one at the top of the page. 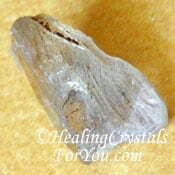 Raw natural pieces are often quite fragile and so could break easily if kept in your pocket. 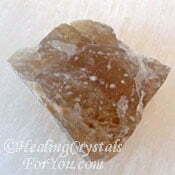 Some pieces of natural Albite stone may also be very large pieces, so again this makes it hard to keep it on your body. If you'd like to use it to help to stimulate lucid dreaming, keep a piece on your body during the day, as this may be advantageous. Alternatively simply place a larger specimen in the bedroom near to where you sleep, so its vibration will encourage you to lucid dream. 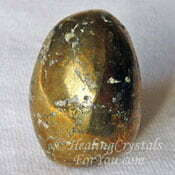 The vibration of these stones has an advantageous effect within the chakras above the heart. 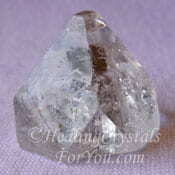 In particular it resonates within the third eye and crown chakras, as mentioned above. 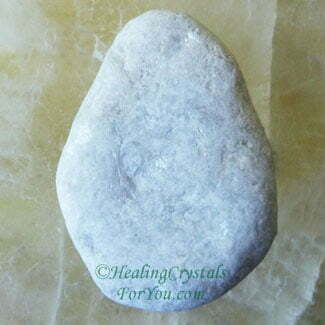 These stones are not as well known as some third eye stones, but their energy is highly beneficial to stimulate this important area. 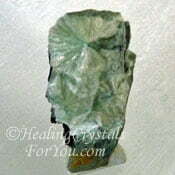 The third eye chakra and pineal gland is related to helping you to develop a range of psychic gifts. 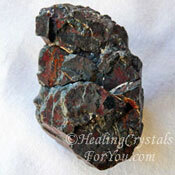 These stones have excellent metaphysical properties that may be advantageous to use in meditation. 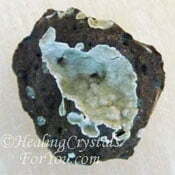 Using one of these stones may enable you to make a direct connection to the Divine mind and your higher self. This Divine connection may inspire greater spiritual progress, and may intensify the development of inspired intuitive capacity. 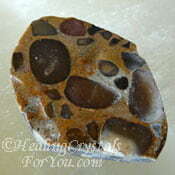 If you use these stones while traveling within the higher realms, they are known to smooth the path of your explorations. 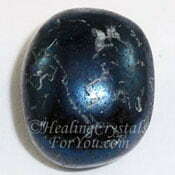 They may aid the development of remote viewing, and their energy may awaken a dormant third eye chakra. 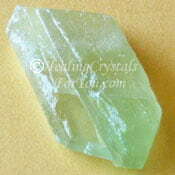 They are also known to heighten your capacity to explain to others what has occurred while meditating. 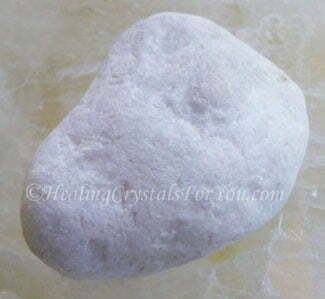 Due to its strong stimulation of the brain these stones are helpful to aid healing of injuries caused to the brain by accidents. 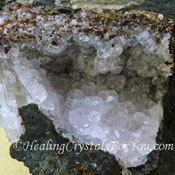 These white crystals are also said to help those with Alzheimer's Disease and Parkinson's Disease, and they may assist with healing problems in the eyes. They are known to aid the assimilation of nutrients from food, and may help health problems in the gut such as heartburn and stomach ulcers. 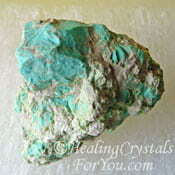 They are known to help with the release of old habits that may be causing you health issues. Their energy is said to have a quite general affect to purify areas of the body that may be having issues that are not able to be clearly diagnosed, as well as assisting muscle and tendon problems. 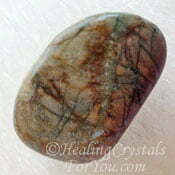 These stones are useful for healers to use, as they help to stabilize any healing that is taking place. "Very little is needed to make a happy life. 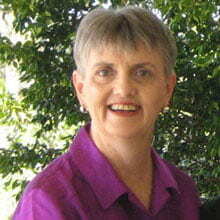 It is all within yourself, in your way of thinking." Marcus Aurelius. 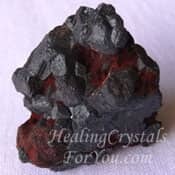 To strengthen the energy of this stone to stimulate your memory, you may like to use it with other stones that helpful to boost your ability to remember what is of value to you. 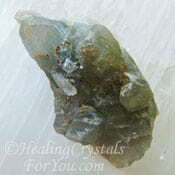 There are a number of other stones that are also beneficial to help your memory including Datolite, Diaspore, Baryte, Axinite, Herderite, Emerald, Azurite and Green Calcite. 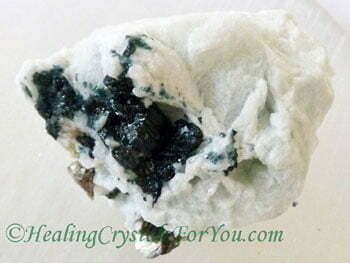 If you feel that you need help to assist you to think more logically, often known as left brain thinking you may choose to combine it with Activation Quartz, Goshenite, Moss Agate, Hematite, Chalcopyrite or White Onyx. 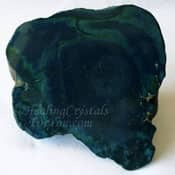 This stone has a good action to assist lucid dreaming when used alone but if you want to strengthen the way it works use it with other stones for this purpose. 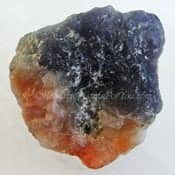 Use it with other stones that help you to experience lucid dreams such as Wavellite, Dream Quartz, Diaspore, Blue Sapphire, Scolecite, Ruby, Sugilite, Covellite, Angelite or Goshenite. 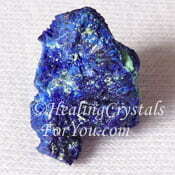 Thinking more clearly is one of the effects of using this stone and it is of value to help you in your everyday life. 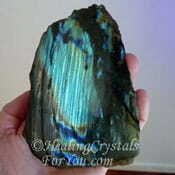 In order to boost your clarity of thought, use it with other crystals such as Pollucite, Stilbite, Pudding Stone, Picasso Marble also called Picasso Stone, Smokey Quartz, Magnetite, Analcime, Turquoise or Thomsonite. 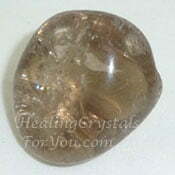 These are strong third eye stones that are powerful to use when you are meditating. 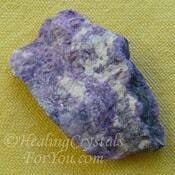 You may choose to also use other stones for this chakra when you are meditating in order to stimulate this area. 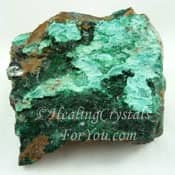 There are a number of other stones that also stimulate the third eye including Atacamite, Labradorite, Malachite, Turquoise, Kammererite, Vivianite, Afghanite or Cookeite. 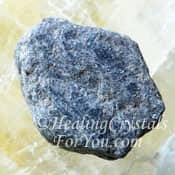 Using this stone may also help to boost your intuition, especially if you use it every day in meditation, and it may also be beneficial to keep it on your body for this purpose. 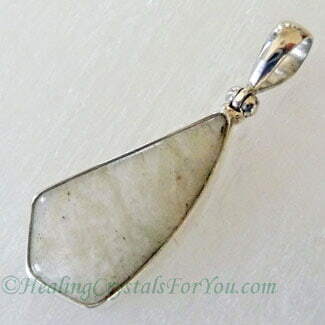 While using it alone will stimulate both your intuitive gifts and the accompanying inspiration that this stone can stimulate, you may choose to combine it with other stones for developing intuition. 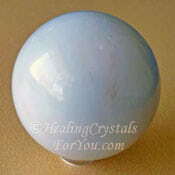 Stones you could use for this purpose includes Rainbow Moonstone, Prehnite, Iolite, Apophyllite, Iolite Sunstone, Euclase or Plancheite.